Prof Usha Ramanathan is a Professor of Sustainability and Supply Chains in Nottingham Business School. Her teaching experience spans for over 20 years in India, Oman and the UK. Usha is a module leader for ‘Data for Operations Decision Making’, one of the new modules for PG courses, combining data analysis and decision-making skills. She is also involved in teaching UG and PG modules on Global Supply Chain Management and Operations Management. 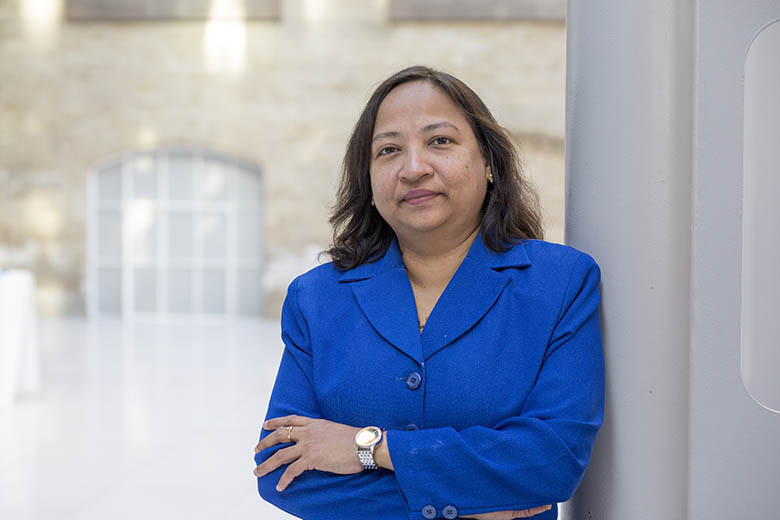 Usha’s research interest lies in the area of supply chain and operations management, retail customer behaviour, Big Data and the Internet of Things. She is actively engaged in research activities within the Business school across various disciplines such as marketing, strategy, retail service operations and supply chain with a view to producing high number of academic/research outputs to support research funding applications and the forthcoming Research Excellence Framework (REF). Usha is the Research Coordinator for the Department of Management. Prof Usha Ramanathan joined Nottingham Trent University in March 2016 as a Reader in Supply Chain Management. Before joining NTU, Usha was a Senior Lecturer in the University of Bedfordshire, where she was a course leader for Executive MBA programme running in the UK, Oman and European countries. She supervised many PhD students to completion. In the past, she worked in Higher Education sector within the UK and outside, including University of Nottingham (Teaching Assistant), University of Bedfordshire and Northumbria University (Senior Lecturer) in UK and Middle East College, Muscat, Oman. Usha is a regular session chair for many international conferences namely EurOMA, POMS and OR Society, India. She has been a scientific committee member of the prestigious European Operations Management Association (EurOMA) since 2013. Usha delivers special lectures on collaborative supply chains and sustainability in conferences and workshops. Usha is a Chartered Member in the Chartered Institute of Logistics and Transport. Usha’s research interests includes supply chain collaboration for sustainability, role of collaboration in SMEs’ performance, Collaborative Planning Forecasting and Replenishment (CPFR), value of information sharing and forecasting, e-commerce, RFID, Big Data, retail customer behaviour and loyalty in the contexts of service and operations. Usha’s case-based research are focussing on recycling, upcycling and Verbund concepts. She uses case studies and quantitative approaches such as Structural equation modelling, simulation, AHP and SERVQUAL in research and analysis. She has published in leading journals such as International Journal of Production Economics, International Journal of Operations and Production Management, Expert Systems with Applications and Omega: The International Journal of Management Science. Some of her research work obtained high honours such as the ‘Highly Commended Award’ at the Emerald Literati Network Awards for Excellence in 2012 and 2018. She obtained funding for her research projects from the British Council, the British Academy, Newcastle Business School and the Nottingham City Council. Usha’s research proposal ‘Reduction of carbon footprint in UK food retail chains’ was selected for the PhD student scholarship from Vice-Chancellor, NTU in 2017. Usha is an external supervisor for PhD students in the University of Bedfordshire and external examiner for Northumbria University. Her students are presently working in the areas such as Chinese SMEs’ collaborative relationships, e-supply chain performance of Chinese companies, and sustainability in food retail sector. Chartered member of the Chartered Institute of Logistics and Transport (CMILT) from Feb 2011 (life membership). Usha’s PhD was partly funded by the University of Nottingham during 2006-2009. She was awarded in 2017 a grant from the British Council–Newton fund to conduct a workshop in Unidavil, Brazil. The follow-up seminar was conducted in NBS with many collaborators from Brazil and UK Universities. Usha obtained sponsorship from the British Council in collaboration with University of West of England to attend a workshop in Thailand on Short Food Supply Chain in March 2016. She also secured funded places to attend workshops in Mexico and India from the British Council. Recently, Prof Ramanathan secured funding from Continuation, Growth and Development Fund, Sustainable Futures Steering Group, Nottingham Trent University to conduct a study in India with Thiagarajar College, Madurai to explore the challenges and benefits of converting waste to ingredient: A Verbund concept. Usha is working with Academics from UK Universities and many other Universities around the world such as Palermo University, Italy; Indian Institute of Technology Madras, India; Concordia University, Canada; Monash University, Australia; University of Massachusetts, USA.